Located at the heart of CityCenter, the AAA Five Diamond ARIA Resort & Casino is a dramatic, yet graceful combination of striking architecture, impeccable hospitality and sustainable design. From the awe-inspiring lobby to the naturally-lit, spectacular public spaces, ARIA provides each guest with a truly unmatched experience. Described as a vertical city-within-a-city, CityCenter redefines the Las Vegas skyline with its unprecedented accommodations, arts, attractions, and amenities. ARIA's prime location within this urban destination provides ultimate access to the most exciting entertainment, nightlife and dining on The Strip. ARIA's 4,004 guestrooms, including 568 suites, offer custom furnishings, lavish amenities and exclusive, integrated technologies which allow guests to customize their stay to meet their personal preferences. Designed by world-renowned Pelli Clarke Pelli Architects, ARIA's unique shape delivers expansive floor-to-ceiling windows in every guestroom and corridor offering breathtaking, panoramic views. Within each guestroom and suite, every detail has been considered and every need anticipated. The unique layout of ARIA's casino floor allows guests to enjoy the energy and excitement of their favorite games in a more personal and intimate setting. For high-stakes players, exclusive salons offer high-limit slot and table games in private environments. 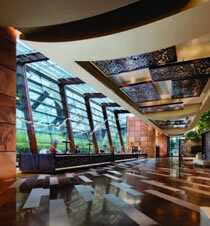 With innovative technologies and unrivaled customer service, gaming exhilaration is exemplified in a new light at ARIA. After discovering the stylish retail venues within ARIA, extraordinary shopping awaits at Crystals, CityCenter's retail and entertainment district. Just a few steps from ARIA, Crystals is home to more than 500,000 square feet of the world's most elite luxury brands and high-end couture. Under its canopy of unprecedented brilliance, Crystals features renowned retailers, including Louis Vuitton, Tiffany & Co., H.Stern, Rolex, and Ermenegildo Zegna. 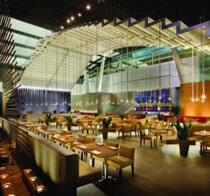 Visitors can also explore exceptional tastes within new dynamic dining concepts, including Brasserie Puck from internationally acclaimed Master Chef Wolfgang Puck and Beso, the restaurant from Eva Longoria Parker. - ARIA's BARMASA - Chef Masa Takayama, Japanese cuisine unrivaled! From Asian to nouvelle to the classic steakhouse, ARIA's 16 restaurants provide a wide variety of distinctive dining experiences. Award your tastes with an impressive collection of the world's most critically acclaimed chefs and restaurateurs, including Michael Mina, Jean-Georges Vongerichten, Julian Serrano, Sirio Maccioni, Jean-Philippe Maury, and The Light Group. For the first time, Michelin 3-star chef Masayoshi Takayama brings his unrivaled mastery of Japanese cuisine to Las Vegas with BARMASA. Also new to Las Vegas, James Beard Foundation Award-winning chef Shawn McClain introduces his innovative cuisine at Sage. Whatever your tastes, ARIA has something to satisfy your palate. 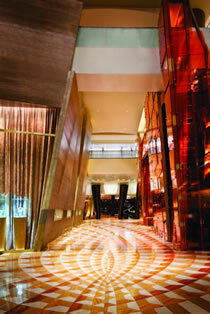 Captivating experiences destined to raise the bar for nightlife and entertainment can be found at ARIA. A dynamic mix of bars and lounges, including HAZE, the seductive new nightclub from industry-leaders The Light Group, provide for an unforgettable evening. As ARIA's entertainment centerpiece, Viva ELVIS™ by Cirque du Soleil® brings down the house with high energy dance and acrobatics along with a rocking live band playing a new arrangement of Elvis Presley's songs. Nostalgia, modernity and raw emotion provide the backdrop for Elvis' immortal voice and the exhilaration and beauty of his music. Current: 9:00 a.m. to 7:00 p.m. Liquid is now open Daily 11:00 a.m. - 6:00 p.m.
For a day of relaxation, The Spa & Salon at ARIA offers a complete menu of skincare, massage and hydrotherapy treatments and spa suites designed to accommodate couples' treatments, bachelorette parties or small group events. Guests can also enjoy the “Shio” salt room, relax on heated-stone ganbanyoku beds, or savor a quiet moment on the spa's co-ed balcony overlooking the resort's beautiful pools. Perfectly complementing the luxurious spa amenities are the full-service salon, barbershop, deluxe fitness room, and group exercise studio. ARIA is your source for Las Vegas' premier meeting experience, featuring modern architecture, distinctive décor and 300,000 square feet of technologically advanced meeting and pre-function space. 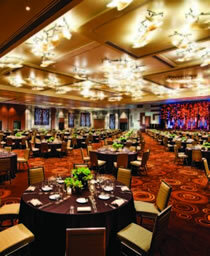 Four ballrooms offer the flexibility to accommodate groups of all sizes from 10 to 5,000 attendees, and three of them feature fully functioning theatrical stages. The world-class facility encompasses three levels and delivers 38 meeting rooms, including two exclusive boardrooms that range from 800 to 2,000 square feet. The north façade features a spectacular glass curtain wall overlooking ARIA's beautiful pools, providing a lush, landscaped backdrop and the warmth of natural light for special gatherings.